I started this quilt last fall when I was feeling particularly homesick for the States. In the corners I was going to add some appliqué, but I think I am going to leave it blank and do some pretty quilting. I've never done trapunto - so maybe that would be a good idea for that area. 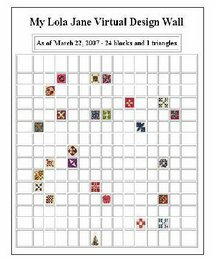 I'm piecing red and off white half square triangles for the border right now. I'm not quite sure how I am going to lay them out yet, but I'll figure something out. All the cats were asleep, so I was able to get the quilt up and off the floor before they knew what was going on! I hate not having something to do with my hands when I fly, so I thought I would put together a little "kit" to work on. I cut up my beautiful collection of Dutch fabrics (that was painful.) I decided to make 8 pointed stars, I have an idea of how I want to put them together, but I'll just have to see where it goes. I'm paper piecing them and have everything I need in a little pouch. I wound different colors of thread on bobbins to take up less room and included a little container for pins. I included a thimble and some needle threaders. I also added a thread cutter. I had heard that even those would be a problem on airplanes, but it was no problem. My kit worked really well, though I kept dropping my thimble on the floor and it would roll down the isle! I'm not sure of a solution for that! This was my treasure for the day, an old antique toy horse and an old box made from lit matches! It's so pretty! I haven't seen this much snow since we lived in Colorado, and people are still riding their bicycles! This is another quilt that I have been working on for a while. I decided to get those old projects done this year! Sorry about Willy in the picture, those of you with cats will surely understand! Cats can be sound asleep and as soon as a quilt hits the floor, it is like Big Ben is going off and they have to come see what is going on. The appliqués are fused on the top and I'm doing buttonhole stitching to secure it. I plan on machine quilting it. I think I will tea dye it when it is done, not sure yet. These are a couple of quick miniature quilts that I worked on over the weekend. I had picked up some antique quilt blocks at a flea market in the States and thought I could use them for something! I added a small border, did a little quilting and added some old buttons. It's fun to do something really quick sometimes. I've started working again on my version of the Dear Jane Quilt. I've been working on it off and on for a couple of years now. Hopefully I will keep motivated to get a few blocks done a week. The picture above is of the original one that is now located in Vermont. 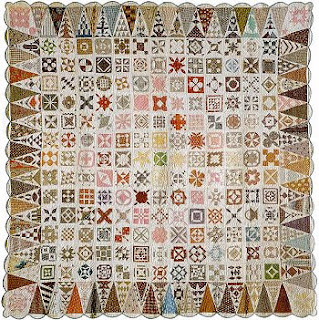 It's hard to believe that one woman (Jane Stickle) actually finished that quilt in 1863 without the benefit of our modern methods today! Sometimes I like to take a break from quilting and do some knitting. I mainly make socks, scarves and shawls. I love to do lace knitting but I tend to drop the yarnovers really easily and end up getting frustrated and stop. One of these days I will make a lace shawl! 25th Anniversary Quilt - Done! On the 30th of January, Ed and I were married 25 years ago. It’s really hard to believe. Mentally I still feel like I’m in my 20’s but I quickly face reality when I look in the mirror or try to pick up something off the floor and feel the pain in my back! We went out for a very nice dinner and Ed brought me some beautiful flowers. On the 19th of this month we are headed to Rome for a week for an anniversary gift to each other. I’m really looking forward to it!!!!! I made the quilt pictured above in honor of our anniversary. Our kitty family is all with us now! Ed brought back Tommy from the States last week. He is doing well (Brad - you made my cat really fat!) Gabby and Willy are slowly adjusting to having their big brother back in their lives. He loves the patio and hopefully he will not jump off! Tommy's favorite person is Ed, and this is his favorite spot in the house - on Ed's chest! I apologize in advance to anyone that visits that is allergic to cats!! !